"We can meet at Carol's to park my car and ride together to Joyce's home up in the Pine Hills", Betty relays the driving plans for the Monday Night Quilting groupies. "Carol won't be going, she has a hot date at the Mustang game". Sue and Sara live just a few miles apart, so they get together and pick up Betty who has left her car at Carol's (it's on the way). "So Sue, how was Seattle last week? Did you get to do anything fun?" 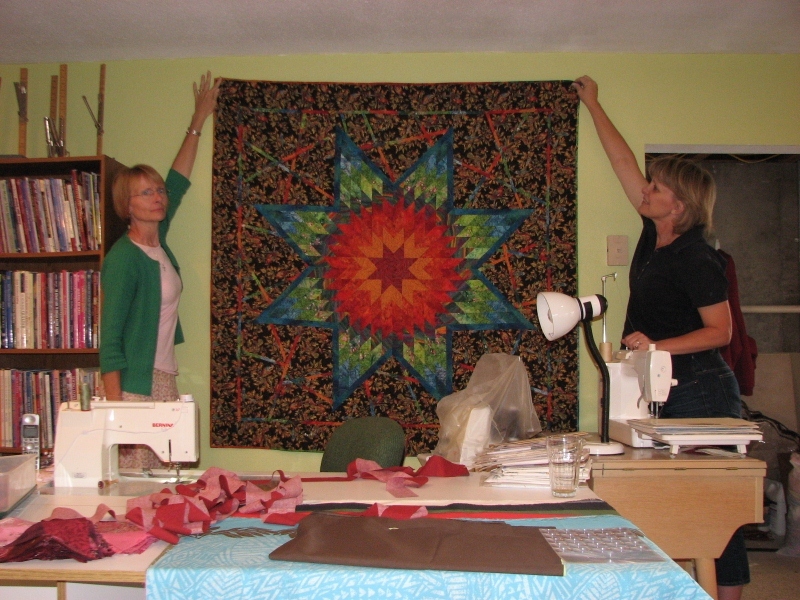 "Mostly I was working, but I managed to hit a few fabric stores, one in a little town in the mountains Northeast of Seattle, we kinda got lost driving around, always a good reason to stop at a quilt store, you know, to ask directions. I'll show you what I picked up when we get to Joyce's, oh, and I stopped by Missoula and picked up a growler of that beer you like, Cold Smoke, nothing like a cold beer on a hot night". Sara and Betty glance at each other with a questioning stare, they both want to know how Sue can do so much traveling, and shopping. Usually Sue only buys fabric on sale, but she sure seems to be finding more good deals, and in other States no less. Joyce lives out in the boonies on a bunch of acres. Her husband needs a lot of space for his hobbies. Just to be fair, Joyce has talked her husband into turning their tuck under garage into her quilt room. It's almost done, and she can't wait to show it off. The quilters arrive and Joyce ushers them into her kitchen where she's prepared a light meal of tuna sandwiches and snacks. "What are you doing with the crusts of the bread?" asks Sue (Joyce has cut off the bread crusts from the sandwiches) "I eat all the parts of the bread, so you don't need to do that for me"
Joyce pulls out 2 bottles of wine from the fridge, but Sue hauls up the growler and says "save the wine for another day, we have dark brewed beer" The ladies all dish themselves up for the meal, a part of the routine for the Monday Night Quilters. Downstairs Joyce leads the group to her pride and joy, her newly painted quilt room: "lime green, it's the new neutral" Joyce smiles! "I have this quilt I want to hang in here, what do you think?" The friends hold up the quilt, right behind the main sewing table, looks really good, go ahead, hang that star quilt! 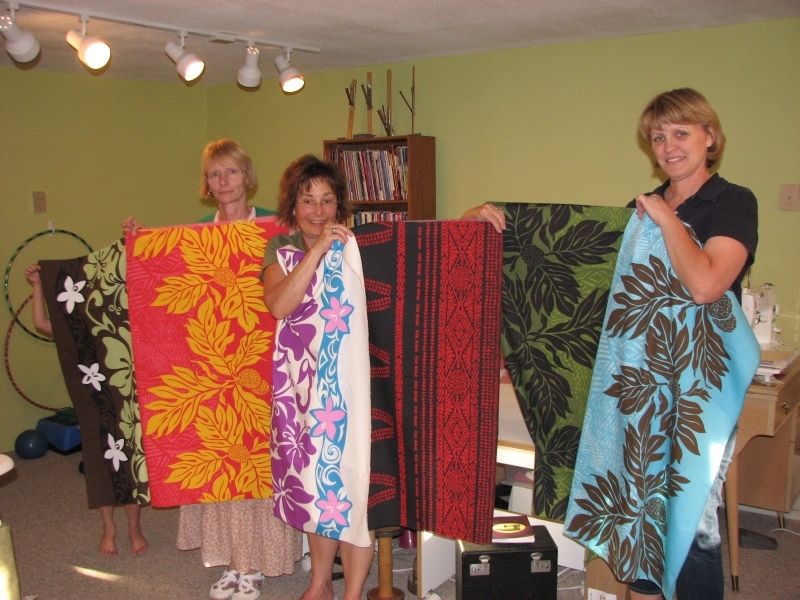 Next thing you know Joyce is pulling out some striking Hawaiian fabrics. Her Son went to Hawaii a couple of weeks ago and he didn't know what to get her from the fabric store, so he just bought a yard of each one he liked. 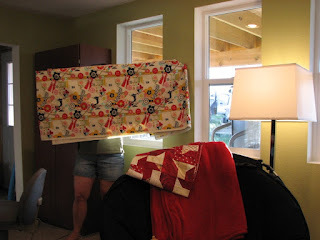 We all roll our eyes, wondering what you have to do to get your kids to buy you fabric when the go on vacation! I suppose we can all make some kind of strong hinting remark at the next family dinner table. Strange to look at the picture and notice how many of the prints actually work with the lime green, weird! Next thing you know, more fabric is coming outta the closet, next it's the new curtain fabric. It may take a year or so to get the curtains done (quilts or curtains first, that is a hard question). Not a whole lot of sewing got done last Monday Night, but some people were able to brag about their quilt rooms and their quilt fabric. Sometimes you just have to get support for your next project from your friends. Next time, we're headed to Sue's house.